According to Snarknews (in Russian only), Shanghai JTU has become the World Champion for the third time (2002, 2005, 2010), this means it has the same number of victories as the Stanford University and the SPbSU ITMO. Then goes the Moscow State University (Gusakov, Kornakov, Razenshtein) - the European Champions! Congratulations to the team and to their coach Anton Pankratiev! The next one is the biggest surprise of this contest (IMHO) - Taiwan National University. Personally for me it was a pleasant surprise, because in November I visited Taiwan - a nice island! I recommend it to everyone. It was my first trip to Asia, a good start . The following two teams - Kiev State University (Grinenko, Neiter, Simonenko) and Petrozavodsk State University (Denisov, Nikolaevskyi). In person I know only the guys from Petrozavodsk, I'm glad for Alexei, Denis, Ilya, and Denis Petrovich, Vladimir Alekseevich, Victor Nicolaevich - congratulations to all of them! An interesting fact: the three leaders of the last Petrozavodsk training session took the positions among the five best teams, and in the same order! The sixth place - Tsinghua. The seventh - alma mater, Saratov SU (Bondarenko, Matov, Yakunin)! Congratulations to Natasha, Dima, Vova, Misha, Antonina Gavrilovna on their silver medals! The eighth position - Warsaw, a nice city. The ninth - St. Petersburg SU (Antipov, Levin, Smirnov), the forth medal to our North-Eastern European region. 10th and 11th were Zhongshan and Fudan. The 12th was the University that hosted the previous World Championship in Stockholm - KTH, Sweden. Congratulations to the medalists once again! UPD. It occurred that SPbSU has the same penalty time as the eighth position. Moreover, there is a chance that Russia will have one more medalist - Ural SU (Burmistrov, Dublennih, Kurpilianskyi) occupies the 13th position and is the last team which solved 6+ problems. UPD2. 4 gold medals, 5 silver medals (including SPbSU), 4 bronze medals (including UralSU). Totally, NEERC is the Vice-World champion, the European champion, got a gold medal, three silver medals and a bronze one. January 30, 2010 the delegation of the Saratov State University is leaving for the World Finals of the International Collegiate Programming Contest. 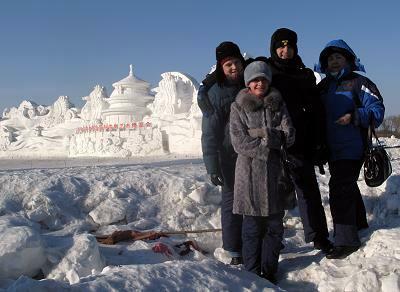 This year it's held in Harbin (hi, China), and that means that apart from an interesting contest, we have cold weather, ice statues, fried rice with prawns, and as I hope, Beijing Duck. Our University will take part in the Contest for the 7th time, and for the team Saratov SU#1 this will be the 2nd Finals. It seems to be high time to introduce myself. I'm Mike Mirzayanov, and I'm this team's coach (and also all other teams from my university). In reality I'm the director of Programming Competitions Training Center, but in this case it doesn't matter. I became a part of this so-called olympic movement quite long ago, but since that time I've managed to take part in the finals of the ICPC, and in the finals of Google Code Jam, and onsite competitions by TopCoder (TCO and TCCC both). In brief, I do know what computer programming competitions are, but we won't speak about me. We will speak about our team Saratov SU#1 and their participation in the coming World Finals. I plan to write a series of articles about our trip to China. No one knows, on whom Lady Luck will smile, and whether we'll return triumphant or defeated, but I hope my account will seem interesting to someone. Any questions? Ask them in your commentaries, and I'll answer them with pleasure. Paveletsky station met us as usual. Taxi, taxi, where are going young man? In the subway suspicious persons sell cellphones near the proclamation: "unauthorized trade is prohibited, fine of 10000 rubles". Fortunately the queue for tickets in the subway has flown by quickly - well, that we got up at first in two, as one moving twice as fast. Dima Matov quickly noticed that in Moscow we have arrived too early - beginning tomorrow at Mu-Mu cafes begin discounts of 50%. And when you try to change rubles into something more international we noticed that today is Sunday and banks do not work. Yes, we have arrived in Moscow too early :). I went to Starbucks and sold Internet for 100 rubles. It was constantly falling off - so I hasten to write these lines before it disconnects again. In the evening we will sit in the airplane, fly through Beijing, there will be 2.5 hours connection and "Hello, Harbin". If you write solutions on C++ it regularly happens than input reading through std::cin appears to be slow because of the large input size. Certainly is more correct in such cases to write data reading more effectively - at least using scanf. But if the testing system uses GNU C++ (checked on MinGW 4.4.1, but I think it works on other versions too), and you don't want to rewrite input reading, it is possible to improve performance by only one line placed in the beginning of the program: ios_base::sync_with_stdio(0). On my example where it was required to find the sum of one million integers, it has accelerated the program in 4.5 times. Tried to do the same test on MS Visual C ++ 9.0 - but it hasn't accelerated the reading. The World Finals of the 33rd International Collegiate Programming Contest for was held in the capital of Sweden, Stockholm. The contest was held in Europe for the third time: in 1999 it was held in Eindhoven (the Netherlands), in 2004 - in Prague (the Czech Republic). It was the first time the key role in the competition had been played by the University: it was held in the library of the Royal Technological University. One hundred best teams of the world took part in the final, while the preliminary rounds saw 7109 teams from 1838 Universities and 88 countries competing. It was the sixth time the Saratov State University had took part in ACM-ICPC World Finals. The participants were placed in two hotels in the historic centre of Stockholm, Gamla Stan district. Our team was placed in the Grand Hotel Stockholm, the city's oldest hotel, built in 1874. The breathtaking view on the Old City and the Royal Palace made this hotel the favourite place for many film stars, politicians and other celebrities. The Grand Hotel is the only hotel in Sweden with the prestigious status The Leading Hotels of the World. Server time: Apr/26/2019 13:51:29 (e1).